You're Fired! is an infinite runner starring Jerry Canned. Perhaps doomed from the start, Jerry was recently canned. But Jerry is not one to go down without a fight though. He's gonna show them who's fired! With a name like Jerry Canned, perhaps he was doomed from the start. Jerry was a mid-level Systems Analyst at a large tech company. Was being the key word. Today Jerry was called into Herman Resorsez's office and fired. But Jerry is not one to go down without a fight. He's gonna show them all who's fired... he'll show them all. You're Fired! 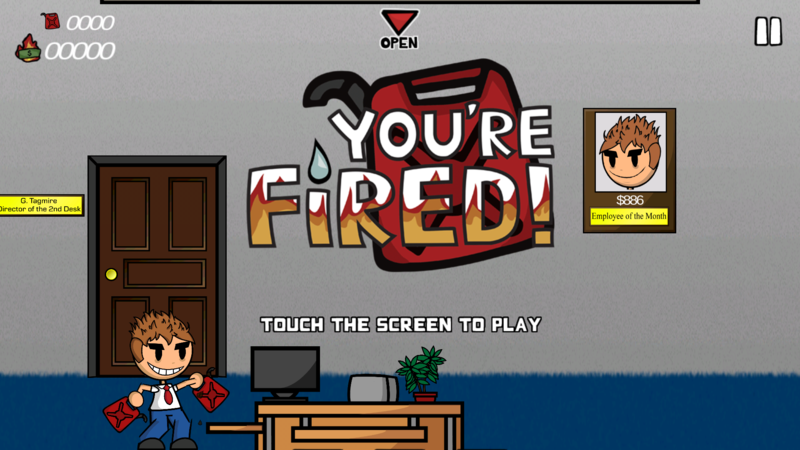 is an infinite runner set in an office building...that's on fire! You play as Jerry burning down the office. Collect gas cans to keep fueling your rampage. Dodge desks, chairs, and curiously low ceiling fans. Don't let anything stand in your way. Not even rocket propelled security guards. Use Molotov cocktails to clear yourself a path. Drink coffee to get a speed boost. Use a flame shield to protect yourself from obstacles. You have one goal: Cause as much damage as possible before getting caught. Cause damage and complete missions to get bonus money. Use the money to stock up on Power Ups. Or use your money to unlock costumes, each with their own theme song. You may have noticed that this game is a little pun heavy. To top it off, You're Fired! is being released on Amazon Fire TV. It will be compatible with the Fire TV controller or the Fire TV remote included with the system. The game is also available now in the Apple App Store and Google Play Store. You're Fired is coming soon to Amazon Fire TV. It will support controller and remote control play. Now that everyone is home and unpacked, we want to thank @TooManyGames for having us and everyone who attended #tmg2017 for playing!